Oh blog, how I have neglected you. My crazy, busy life has kept me from you. But my latest race report seems to be too much for a Facebook update or even my regular race report log. 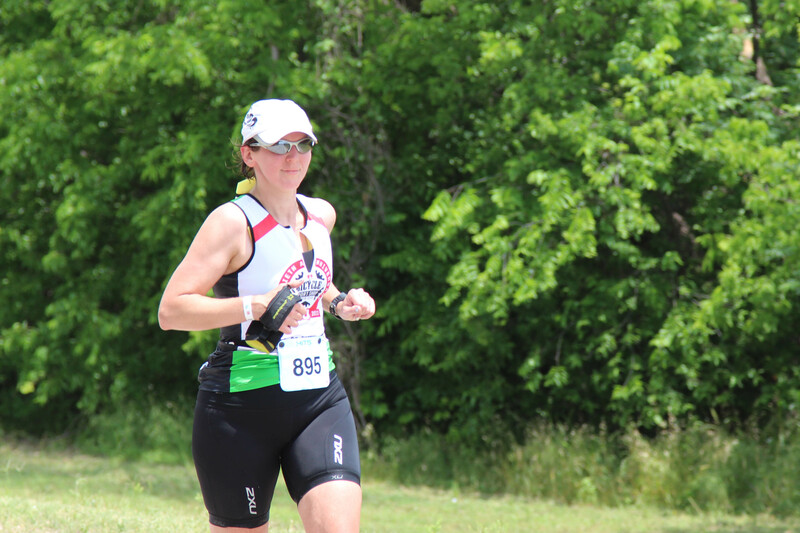 I had been doing triathlon for 3 years and competed at Age Group National Championships my last triathlon season in 2011, which was a humbling experience. My last race of that season qualified me to compete again at Nationals in 2012. I was so excited to come back to Burlington and do the race again. 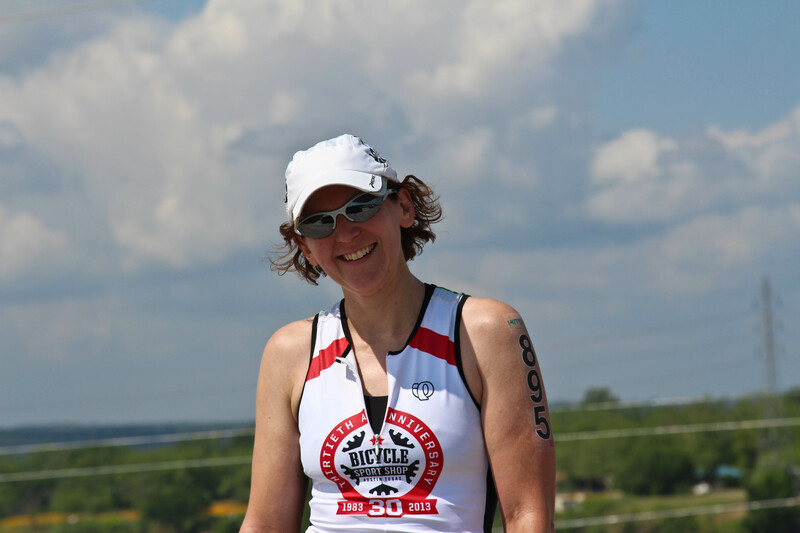 I also had plans to do my first half distance triathlon race (1.2 mile swim, 56 mile bike, 13.1 mile run = 70.3 miles) that summer. I had three things I wanted to accomplish before I would sign up for my first half, and I had accomplished all of them. I felt like I was ready and had my eye on doing the Patriot Half in June. But things didn’t work out as I had planned and our family had to move to Austin, TX that summer. I just didn’t think I could train for a big race and deal with a move at the same time. Looking back on it, it was the right decision, but I was disappointed. 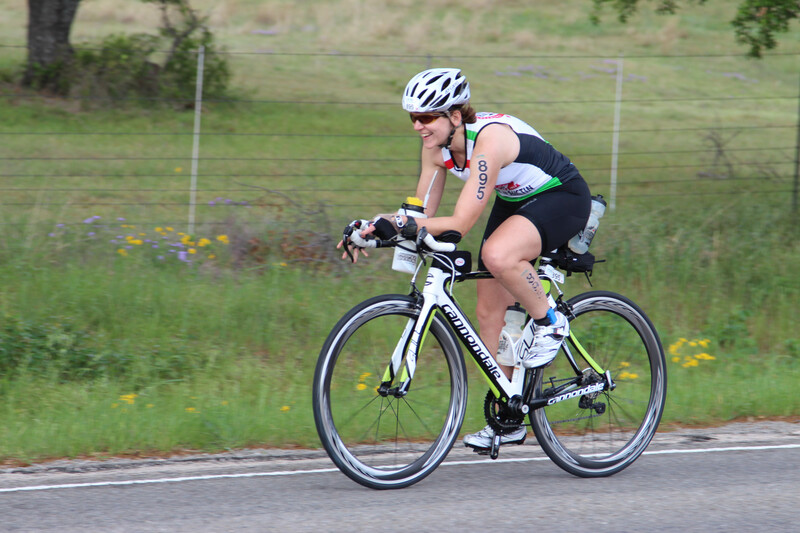 Shortly after arriving in Austin, I scoped out the half distance triathlons near Austin in the spring and decided on the HITS Triathlon Series since it was so close to home and timing was right. I wanted a race that was low key and close enough that I could practice the course at least once. I probably should have considered the difficulty of the course when choosing my first at this distance, but having a challenging course has never stopped me from signing up before. I wasn’t sure if this was going to be my one and only race at this distance. I knew it was going to be a challenge and a step up in training. It seemed like the right time to get a coach. Being already comfortable with Martha Grinnell and familiar with her coaching style, she seemed like she would be a good fit for me. So two weeks after my second fall marathon, I started working with Martha in December. It was a tough start to training. I was still getting over some issues with my knee and hip that had developed after the October marathon. And I hadn’t fully recovered yet from my November marathon either. Plus getting used to juggling more workouts with my already busy schedule was hard. But by the time I was about the halfway point in my training, I really noticed things starting to fall in place. I was looking forward to my workouts, especially all of the long bike and runs on weekends. I was starting to find my happy place again. But on March 24th I hit the lowest point in my training. I had a long ride scheduled and decided to head out to Marble Falls and ride the bike course while Bill and the kids went strawberry picking and hung out nearby for the day. I was already nervous about the ride since winds were 20-30mph. But it turned out that wasn’t the only difficult thing about the ride. Biking alone on 70mph roads by myself, sometimes with no shoulder, was a little terrifying. Some drivers were nice enough to give me plenty of space, some less so. And the roads were not so smooth. I finally learned what Texas chipseal was. I was not a fan, and neither was my bum. Finally I turned onto a quiet road with little traffic, but quickly wished I was back on the previous roads. 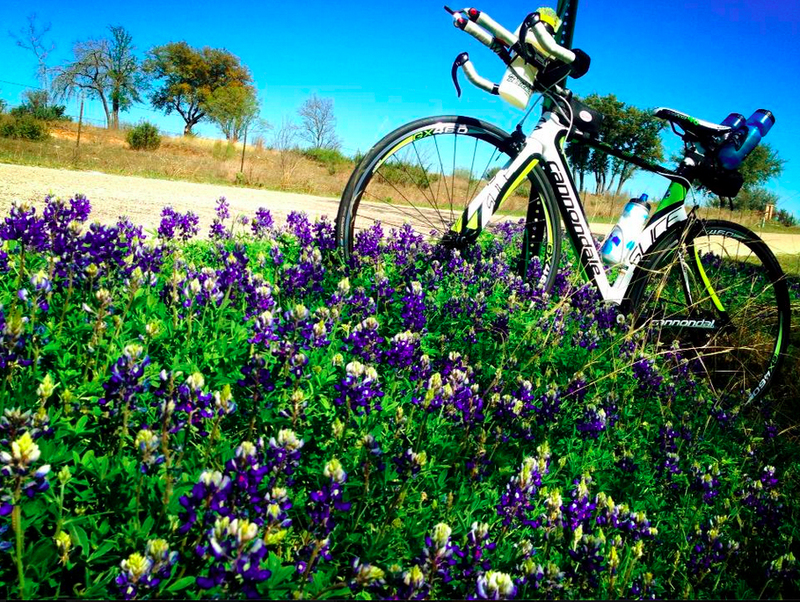 Old Spicewood Rd was too ridiculous to have in a triathlon. It was so much more rough that the chipseal. My whole body shook while riding on this surface which resembled fixed gravel. But the worst part were all the cattle guards I came across. I had never seen a cattle guard before and didn’t have a clue what to do with them. Some of them were even at the bottom of steep descents with turns. All I could picture were triathletes being flung into the air when they hit one of those cattle guards at the bottom of a hill. I continued as long as I could but gave up shortly after crossing the 17th cattle guard. I only had 6 more miles to go to finish the course. But by that point I was physically and mentally exhausted and it just didn’t seem to make sense to continue. I called Bill to come pick me up and bring me home. By the time I got home, I was pretty convinced I wasn’t going to do the HITS race and was quickly looking for a substitute race. But the next morning I talked to my coach. She seemed confident that I would be able to do the race. She wasn’t going to let me back out. So I just needed to adjust my expectations, dig in, and do it. Two weeks later I was back in Marble Falls for the HITS Tri Camp. I was scared, but excited to complete the bike course this time. As soon as I met the race director who was running the camp I found out the bike course had been changed for the better, MUCH better. Old Spicewood Rd was no longer part of the course, nor were the cattle guards. And the busiest road was going to have a lane blocked off for the racers. I was so relieved. Apparently the city came up with the course for this year. But as soon as the race director got into town and drove the course, he knew the bike course had to be changed. They were able to come up a new, safer course. I did a lot of swimming and biking and running the next 3 days at camp. It was great to be training with people again. I didn’t realize how lonely I had been. I worked hard, but everything was feeling great. And having the opportunity to train on the course that weekend was huge. I felt even more prepared and was so ready for race day to be here. 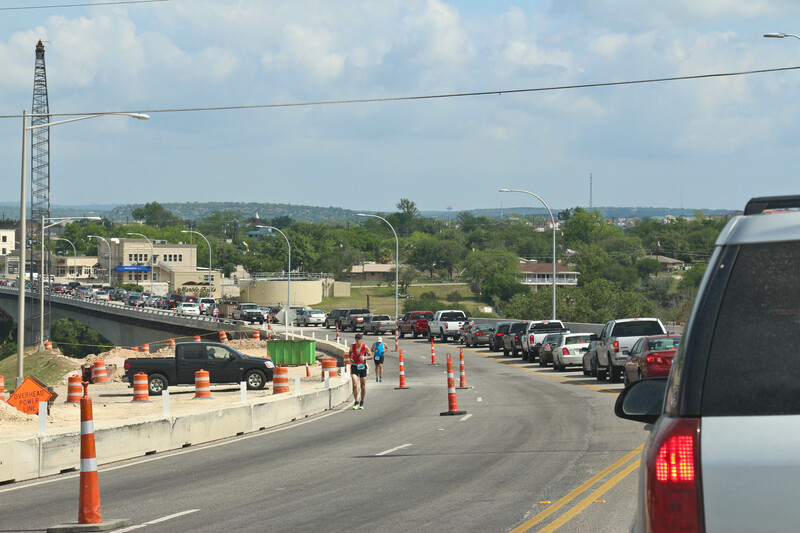 By the time the kids were out of school on Friday, there was a lot of traffic already heading out of Austin. I knew I would be missing the athlete meeting which was moved from 4pm to 3pm a week before the race. 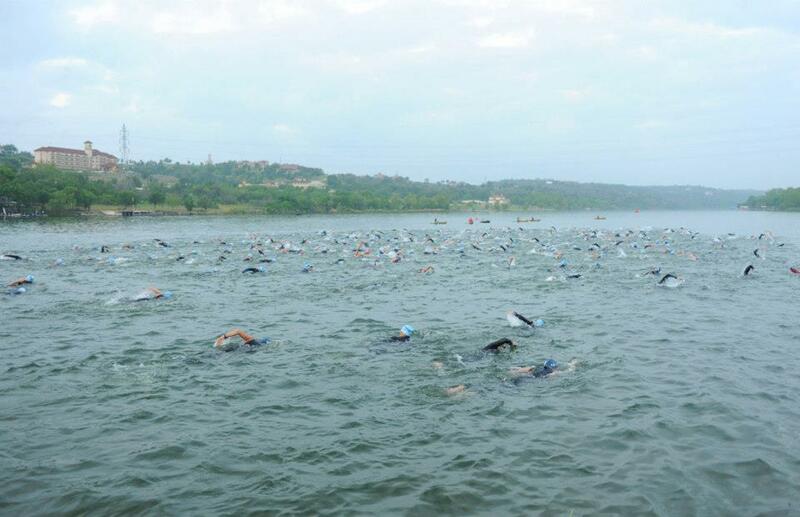 But the race director didn’t think it would be necessary for me to attend it since I was at tri camp a few weeks ago. We got into Marble Falls shortly before 5, plenty of time to pick up my race packet and check into the hotel before our dinner reservations. Packet pickup was super fast. I was disappointed to not see the aid stations marked on the course maps in my packet. But I did see the note that they would be every 1-1.5 miles on the run course. That seemed like that would work out great. We had a good dinner at Double Horn Brewing though it took forever to get our food. Once back to the hotel and got all my gear and stuff organized for the next morning. I’m pretty sure my eyes were shut by 9 and I fell asleep easily. I was wide awake by 3 and couldn’t get back to sleep. By 4am I got up and started getting dressed and all greased up while eating breakfast. Everything was packed and we were out the door by 5:15. 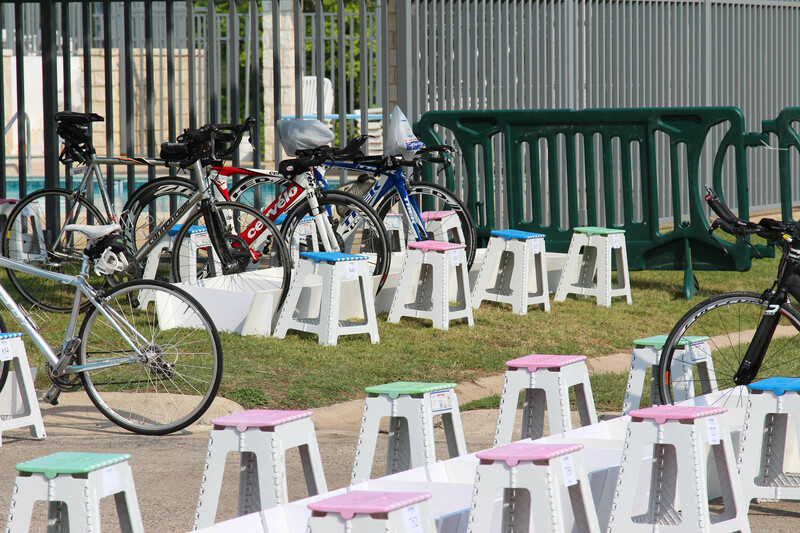 Our transition area was spacious and included a stool. I was a little confused where I was supposed to place all my stuff. I had missed the transition instructions at Friday’s athlete meeting. But the folks around me explained everything I needed to know. Actually everyone was so friendly. I even discovered the person across from me was someone from the trail running group I ran with last fall. Transition had a relaxed feeling. What a great way to start a race. It was sprinkling a bit while waiting for the race to start. But I wasn’t worried. I figured any rain would stop by the time I was on my bike. 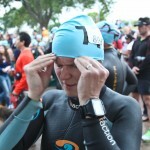 I headed down to the water to listen to the pre-race instructions. The water was 65° which felt way too cold 5 weeks ago, but felt just right today. Thankfully there wasn’t much wind, so the water was calm. It was a mass start, all men and women racing the half and full distances together. There were 442 half and full racers signed up. I’m not sure how many actually started. With such a large group, 2/3 of them being men, my first instinct was to start all of the way in the back. I’m not a strong or confident swimmer, so I wanted to steer clear of any chance of getting knocked around. But my coach convinced me to start in the middle of the pack. So I floated my way over to the right of the buoy and just relaxed and until it was time to go. I hate race swim caps. It was a little chaotic at the start. Some were swimming over me, and I was bumping into others. But mostly I was trying to find that small patch of open water and avoid all the big guys around me. Despite the chaos, I was feeling ok. By the time I reached the first buoy, things had thinned out a bit and I could start relaxing into the swim. I didn’t feel like I was pushing hard. I was right where I wanted to be. Taking a left turn around the second buoy felt great. 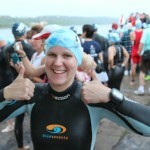 I wasn’t halfway yet, but I was well into the swim and still feeling good. After turning around the 3rd buoy we were headed back on a long straightaway. I was starting to get convinced I was on the wrong path because I was seeing other swimmers really far to my right. But I was sighting well and on a fairly straight path. Turning around the last buoy was great, just a short straight line back to shore. In no time at all I was out of the water and running up the path to transition. 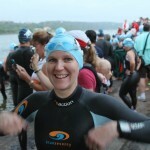 This is the first race where I had the option of using a wetsuit stripper. I’m not sure why, but I stopped and had them help me pull off my wetsuit. I don’t think it actually saved any time. I’ll rethink this option in future races. Running through transition I was reminded of my sensitive feet. I tried to find patches of grass to run on, but mostly it was a parking lot. My transition spot was the third row from the end so it was super easy to find. The stool was nice to sit on to put on my shoes and socks. But I’m sure it also slowed me down. And with the earlier rain, all of my stuff was wet. So I took a moment to also wipe off my glasses. I was not chanting my usual “GET OUT” and my slow T1 time reflected my leisurely attitude. My transition spot was so close to the bike exit, there was very little running in my bike shoes. Perfect! There weren’t a lot of other people leaving transition at that time, so it was actually not so stressful. 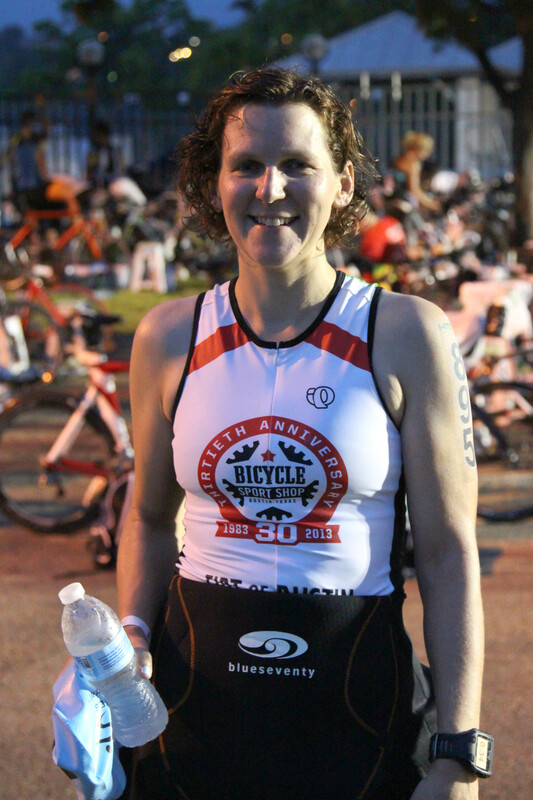 The swim, the hardest part was over (so I thought), and I was thrilled to be on my bike. Sure this was a hilly bike course. But I was familiar with the course and knew what to expect. Plus there wasn’t much wind today. It was going to be a mighty nice ride. The first 5 miles up 281 went pretty well. It was mostly all uphill, but even though I started off riding with my heart rate too high, I managed to get it back down while still climbing. The stretch on 71 was pretty uneventful for me, especially considering how many people I saw on the side of the road with flats in the first 10 miles. I had never seen that many before in a race. Turning onto 962, I knew this was going to be the most challenging part of the bike course. 7 miles of climbing and then 3 miles down to the final bike turnaround. This is where my family was waiting to cheer me on. It was nice to see them. Next time was supposed to be back in transition. 7 miles of climbing also meant 7 miles of a sweet downhill with a beautiful view. I did a lot of smiling during the bike leg, and maybe even a little singing. I was having a great time. If it was getting a little hard, all I had to do was look around at the gorgeous wildflowers and take it all in. Turning onto 71 again and heading back into Marble Falls, I knew I still had a couple of steep hills to climb, but nothing long. I just needed to keep my heart rate in check. Soon I’d be on my feet running, and though normally 13.1 miles of running doesn’t feel like a lot to me, I had never tried it after swimming 1.2 miles and then biking 56 miles. I wasn’t sure how it would go. I did have two hiccups on the bike. The first came around 48 miles. A bug had managed to get caught in my helmet and I could feel it crawling around my head. I tried to ignore it but was so distracted I finally had to stop and let it out. I didn’t know what it was and would have really hated if it was the stinging kind. The next problem was more embarrassing. And I probably didn’t do the right thing, but I panicked. I had just made the turn onto the road in front of transition and my chain fell off my bike. It never happened before on my tri bike and really surprised me. I was able to coast for a bit before I had to stop. I probably only had another 600-700 ft to the dismount line. I wasn’t sure if it would be faster to fix my chain or run the short distance in my bike shoes. I went with the running, but a couple hundred feet of that and I was so frustrated with trying to run in my shoes that I stopped, pulled them off, and chucked them over the fence into the transition area. Wish I had done that sooner since running in my socks was a lot easier and faster. I didn’t take too long switching from my bike to run. But since I wasn’t able to pee on the bike (I tried many times, it just wasn’t happening) I knew I should before heading out on the run. So I quickly ran into the bathroom in transition, adding some time to T2. My family was nowhere to be seen in transition so I assumed they were stuck somewhere in the crazy traffic on 281. Ooo, there were a lot of grumpy drivers on the road. I didn’t experience anything bad, but heard from other racers of some drivers yelling at the racers. Two of the four lanes were closed to the race on 281. But I think the real problem was that they had to stop traffic anytime another cyclist had to turn left after crossing the bridge. Wonder if there’s a better solution if this race will happen again next year? The run course follows the bike course and turns around halfway. So that’s 6.55 miles uphill (mostly) and then back down. And by the time I started the run, it was already around 80° (84° by my finish time) and full-on sun with zero shade. Yep, it was going to be brutal. (In the words of the Optimal Triathlete, “Man that sucked!”) Just a half mile into the run I did see my family stuck in traffic on the bridge. I was a little annoyed Bill wanted me to stop for photos and to chat. But I’m glad I did. Once I said goodbye to them, it was up, up, up 281. I had to do a lot of walking up the hills. My heart rate would immediately jump up to zone 4 anytime I started running. So I alternated running/walking trying to keep my heart rate as low as I could. I was carrying my small, 12-oz handheld bottle and planned to refill it on the course. By the time I got to the second water stop, I already needed to fill my bottle. And I took advantage of the ice-water sponges and started putting them in my tri top. They felt great, but it was still so hot on the course. Looking around at others coming back and still heading up the run course with me, I wasn’t the only one that looked like they were having a hard time with the run. When I got to the 3rd aid station I was really surprised that they were already out of water. The volunteer there was very apologetic. They did have HEED, but I hate the flavor and it doesn’t sit well with me, so I skipped it. I planned to fill up my bottle at the next station. At this point, any hopes I had of some sort of time goal were out the window. My only goal at this point was to stay cool, keep drinking, and finish with a smile. No med tent for me. When I came to the last station I was not only surprised but worried this time that they were also out of water and HEED. They was only three cups of Sprite left. The volunteer here was also very apologetic. At this time an ambulance rushed past us back into town and one of the racers commented that it was probably going to be the first of many if they didn’t start getting water to the stations. Traffic was backed up all of the way to 71 on 281. I’m sure that made it harder to get water to the stations. Thank goodness it was time to turnaround and head back downhill into town. I knew I was going to finish, as long as I didn’t push myself too much. This time when I got to the 4.5-mile aid station they had water again. I filled up my bottle, resoaked my sponges and kept on running at a comfortable pace, though my heart rate was still higher than it should have been. It was shortly after I passed the 3-mile aid station I was trying to figure out why my Garmin distance seemed to be off. Not the usual off it is in longer races, but off by about a mile. And then it dawned on me that I probably turned around too early on the run course. I had assumed the last aid station on the course was also the turnaround. But as I got closer to the finish, I was more sure it couldn’t have been. By the time I saw the finish line I was really not happy. I tried to muster a smile, but it was tough. I didn’t know what to do. Should I run an extra mile in the neighborhood before crossing the finish line? Should I not even cross the finish line? It was way too late to go back 6.5 miles and do the mile I missed, that was for sure. I saw my family right before crossing. It was nice to see them. Bill noticed though that I did not look happy and asked what was wrong. I just shook my head. I was so disappointed. It was such a good day, until the last couple of miles when I realized what had happened. As soon as I crossed the finish line someone put a medal around my neck. But it didn’t feel right. And apparently someone must have also taken off my timing chip, but I have no memory of this happening. I was so focused on finding someone to verify if I did turn around too early. I asked one official looking person and she didn’t know where the run turnaround was. Once I saw my posted time I went to the time keeper and told her that my time needed to be changed to a DNF since I thought I probably turned around too early. She said ok and wrote down a note. From there I worked on drinking and eating a little since I knew I probably should even though I didn’t feel like it. Then I just wanted to head home. I stopped in the building where they were giving out the awards and asked another person at packet pickup if they had a map of the run course with the aid stations marked. She didn’t and also didn’t know where the turnaround was. I gave up trying to figure it out, packed up my stuff in transition and headed home. I was so excited to find my bike shoes I had chucked earlier. They were right where they had landed. And really, there were SO many positive things about the day. I loved the low-key vibe of this smaller race, never crowded. All the staff and racers were great. The weather was nice (no wind! ), though too hot on the run. The transition area was the best I’ve seen. And because of being so prepared, I was able to have a really fun race and enjoy it. Back home and looking at my data, my average HR for the bike was upper zone 2. And it was no surprise that my average HR for the run was upper zone 3. Comparing my Garmin map now to the online course map, I see that I did turn around a half mile too early. I get upset all over again when I think about it. I also see that they haven’t changed my time to a DNF on the posted results. So I need to contact them again to tell them to fix it. I hate that one mistake is overshadowing what was ultimately a great day. I want to put the blame on the race organizers, wishing they had provided a map with where the aid stations were, or had more volunteers at the last aid station reminding people that the turnaround was coming up soon. But ultimately I know it’s my responsibility, and my fault. The good news is even though training for this race was a challenge, I really liked doing this race distance. If you asked me a couple of months ago if I would be doing another half ironman, I would have said probably not. But I’m already planning to do another one when the timing is right. But this time around, I’m going to plan to do more of my training with people. I really miss it. I’m not sure what triathlons I might do the rest of this year. I probably can’t fit many in with my summer travel plans. I do know that I’ll be running the Hood to Coast Relay in Portland this August with a team from Austin. And I’ll finally get to do the NY City Marathon in November. It’s good to have some races already planned for later in the year. I’ve built up a nice base and I’m excited to see what I can still do this year. Whatever I do, I’m going to keep on moving because it feels good and makes me happy. Dena, the 1st of anything is always a learning experience. You had a great race, played is smart and safe and really allowed yourself to enjoy the race and be in that moment. Don’t let that mishap of turning too early take away from all you earned and deserved from your hard efforts and commitments to your goal and process. You rocked! Dena, you never cease to amaze me. I’m so proud of you. Congratulations to a job very well done!! Dena::: Loved reading this, you are amazing! Too bad it wasn’t 100% a brilliant day, but I think you did brilliantly. Hope you have a great season, and that you continue to inspire!